School Nursing is a specialized practice of professional nursing that fosters the growth, development, and educational achievement of students by promoting their health and wellness. School Nursing has evolved over the years to include complex medical, social and behavioral needs requiring an expertise level of care and collaboration. The Lynn Public School Nurses are registered nurses who must complete the certification requirements set by the Massachusetts Department of Elementary and Secondary Education. 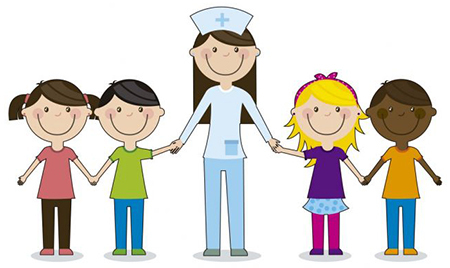 The goal of the Lynn Public School Nurses is for every student to be healthy, safe and ready to learn! Deborah Tanzer - RN, MEd. Children spend a large part of their day at school. Parents, children, school personnel and physicians must work together to keep asthma from interfering with normal school activities. In order to provide the best care to your child, the school nurse will need information from you and your child’s health care provider at the beginning of each school year or whenever there are changes in the treatment plan. Children should be able to take medications when needed. An individual health care plan along with a medication administration plan will be created based on your child’s specific needs. Children can be managed in school with minor asthma symptoms. As long as usual daily activities can be carried out, all attempts should be made to keep the child in school. There should be no restrictions on children’s ability to play, take gym class, or compete in sports just because they have asthma. If the child needs to take medication prior to physical activity, this can be arranged by the school nurse. Rest periods can also be allowed. Classrooms may contain allergens. Irritants such as chemicals for art or science projects should be avoided. Some children with asthma have allergies to food. Please discuss specifics with the school nurse. Flu season in Massachusetts usually starts in the fall and runs through the spring. The main symptoms of influenza (flu) include fever in combination with a cough and/or sore throat. Some people may also have a runny nose, body aches, headache, chills, and feel tired. Some people (especially young children) may also have diarrhea and vomiting. 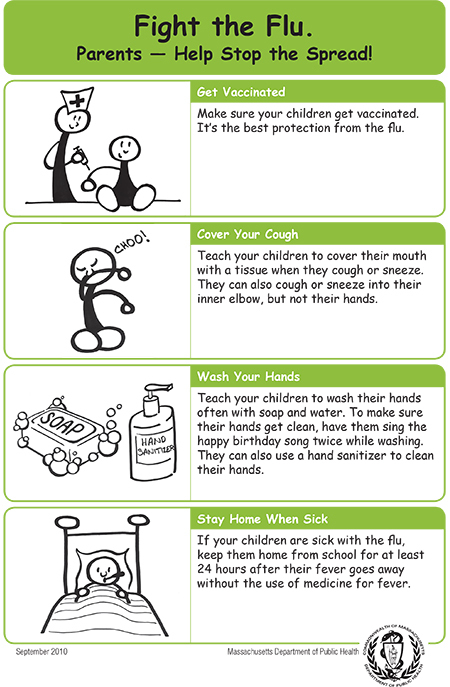 To keep flu from spreading in the community it is important to keep your sick child at home when he or she has the flu. 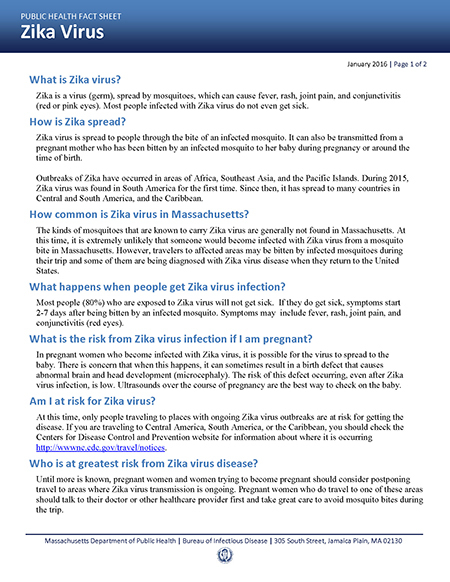 Call the Massachusetts Department of Public Health at (617) 983-6800 or your local board of health. Lice (singular louse) are tiny, wingless insects that survive by feeding on human blood. They cannot jump or fly, and they do not burrow under the skin. Adult head lice or their eggs (nits) are found in the hair and are most often found behind the ears and at the base of the neck. Head lice usually lay their eggs on strands of hair about 4 mm or ¼ of an inch from the scalp. Anyone can get head lice, but in the United States, head lice are most common in children 3-12 years of age. Having lice is referred to as an “infestation.” An infestation with head lice does not mean someone is dirty. Head lice have special “claws” on their legs to help them cling to the hair. Washing with plain soap and water does little to disturb them. Head lice are most commonly spread by direct head-to-head contact with hair of other people who have head lice. Head lice are less commonly spread through contact with an infested person’s personal items, such as hair brushes and combs, hats, unwashed clothing, bedding or towels. Head lice are commonly spread within households. Children often spread head lice to each other during close contact while playing. Head lice can crawl from an infested person or object to a non-infested person. People with head lice can continue to spread head lice to other people until they complete a course of treatment that kills all of the head lice and their eggs. Pets cannot spread head lice. A person who has head lice may feel itching caused by a reaction to the louse’s saliva and feces, but many children have no symptoms. Head lice are not known to spread infectious diseases from person to person and should not be thought of as a medical problem. However, there is some risk of skin infection from scratching. Head lice are certainly a nuisance, but they are not generally considered a health hazard. The best way to determine if someone is infested with head lice is to find a living adult louse. However, adult head lice are rarely seen because they are fast and hide well. Identification of a head lice infestation is usually made by detecting nits attached to the hair close to the scalp. Nits are tiny, grey, oval specks that do not come off of the hair easily like a speck of dandruff would. Behind the ears and near the hairline at the base of the neck are common places to find nits. Nits found within ¼ of an inch from the scalp usually mean the nits are alive and treatment is needed. If the nits are more than ¼ of an inch from the scalp, you should ask your doctor if treatment is necessary. Children should be checked regularly and treated when head lice are found. Parents should learn to recognize head lice and teach their children not to share hats and scarves or personal hair care items, such as brushes, combs and hair ties. There are a number of effective treatments for head lice. Treatment for head lice usually consists of shampooing the hair with a medicated shampoo or cream rinse containing one of the following ingredients: permethrin, pyrethrin, malathion, benzyl alcohol, spinosad, or ivermectin. Shampoos containing lindane are no longer recommended. Safety is a major concern and these products should be used with care, under the supervision of a health care provider (even though some of them do not need a prescription) and always according to the instructions on the label. This is especially important for women who are pregnant or nursing, and for infants with head lice. Be sure to follow the package or label instructions very carefully. Permethrin and pyrethrin-based products have a good safety record but resistance has been documented in the United States. For treatment failures, malathion, benzyl alcohol lotion, or spinosad suspension can be used. Hair should be checked daily for the 10 days following treatment for newly hatched head lice. If these are present, an additional treatment may be necessary. Many of these agents require a reapplication of the treatment 7-10 days later to kill immature lice that may have hatched from eggs that were not inactivated during the initial treatment. Data are lacking to determine whether suffocation of lice by application of products such as petroleum jelly, olive oil, butter, or fat-containing mayonnaise, are effective methods of treatment of head lice. Manual removal of nits after successful treatment is a difficult and time-consuming process. It is sometimes desired, though, for aesthetic reasons, to avoid diagnostic confusion, or to satisfy “no-nits” policies at some schools and daycare centers (see below). Household and other close contacts should be examined and treated if head lice are found. Remember, head lice do not survive for long periods of time off of the scalp. Even though head lice are not commonly spread by contact with personal belongings, the following steps can be taken as added precautions to avoid re-infestation by lice that have recently fallen off of the head of an infested person. - Machine wash and dry clothing, bed linens, and other items that an infested person wore or used during the 2 days before treatment using the hot water (130°F) laundry cycle and the high heat drying cycle. Clothing and items that are not washable can be dry-cleaned OR sealed in a plastic bag and stored for 2 weeks. - Soak combs and brushes in hot (128.3°F/53.5°C) water for 5 minutes. - Thoroughly vacuum rugs, upholstered furniture, and mattresses. - DO NOT USE INSECTICIDE SPRAYS. What is a “no nits” policy? Many school departments and child care sites require that children be free of nits before returning to school and parents should be familiar with their own school’s or day care’s head lice policy. However, both the American Academy of Pediatrics and the National Association of School Nurses advocate that "no-nit" policies should be abandoned. Head lice are not a health hazard or a sign of poor hygiene and are not responsible for the spread of any disease. No healthy child should be excluded from or miss school because of head lice. The Lynn Public Schools has revised its head lice policy to conform to the recommendations of the Centers for Disease Control (CDC), the American Academy of Pediatrics (AAP), the National Association of School Nurses (NASN), the American School Health Association (ASHA), and the Massachusetts Department of Public Health. * educating and supporting students, parents and staff in the detection, treatment and prevention of .head lice. Students with live head lice visualized by the school nurse will be referred for treatment by contacting the parent/guardian by phone, if possible, or in writing before the end of the school day. They may stay in class for the remainder of the day. The student must be treated that evening and present to the school nurse with their parent or guardian to be re-examined the next school day. If there is no longer evidence of live lice, the child may attend school. If the treatment fails, they will be referred to their primary care provider. At the school nurse's discretion the child may be re-checked within 7-10 days of the initial treatment. 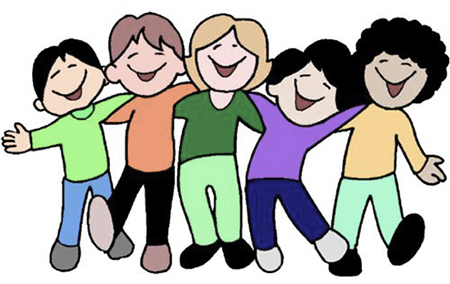 If a student has nits with no evidence of live lice they will be rechecked in one week for live lice and/or more frequently at the discretion of the school nurse. Routine classroom or school-wide screening will not be done in the classroom setting with the exception of preschool and kindergarten at the school nurse's discretion. Siblings and known playmates may be checked in the privacy of the school nurse's office. Students who have symptoms may be referred to the school nurse as needed for examination. 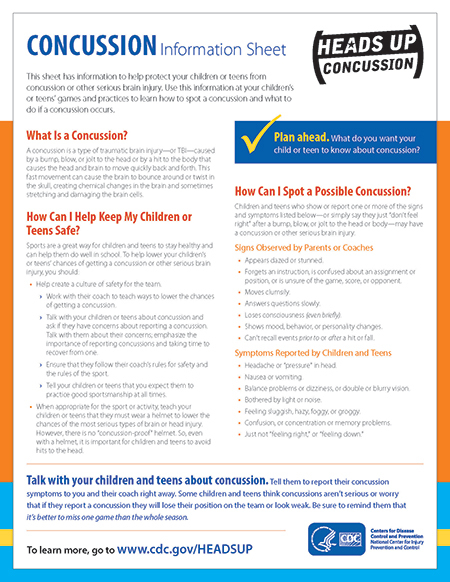 Written information will be given to the parent/guardian to assist in treatment and prevention. The school nurse will provide education to the faculty. Resources will also be available on the school health services section of the LPS website. In the event of persistent head lice, defined as three or more findings of live lice within a period of 6 weeks; the parent will be advised to contact their doctor for other treatment options. The school nurse will offer to make a home visit when all other treatments have failed. Lynn Public Schools require compliance with current Massachusetts Department of Public Health recommended immunization schedules for school entry and attendance. Students who are not in compliance with these regulations will be excluded until the necessary immunizations are obtained and documentation is provided, unless there is a medical or religious exemption. Massachusetts state law requires physical examinations of school children within one year prior to entrance to school or within 30 days after school entry and at intervals of 3 or 4 years thereafter. In Lynn, all kindergarten, 4th, 7th, and 10th grade students and new entrants must have a copy of an updated physical exam in their health record. Pre-sports physicals are required annually prior to a student’s participation in competitive athletics. We encourage students to see their own primary care provider and send documentation. If you need help finding a physician or obtaining health insurance, please let your school nurse know. All pre-kindergarten and kindergarten students shall be screened for lead poisoning at least once prior to entering school. Parent must provide proof of screening to the school nurse. All 1st, 4th, 7th and 10th grade students will have their height and weight measured. The student’s height, weight, and body mass index (BMI) will be recorded in the student’s health record. If parents/guardians do not want their child’s measurement taken, they should send a written request to the school nurse at the start of school year. Upon entering kindergarten or within 30 days after school entry, the parent or guardian shall present a certificate that the student has passed a vision screening within the previous 12 months. If the student has failed or has a neuro-developmental delay, evidence of a comprehensive eye exam must be provided to the school nurse. In school vision, screening will be conducted in the year of school entry and annually through grade 5, then in grade 7 and grade 10. Parents will be notified by school health personnel if follow-up of vision screening is required. If your child is referred for further evaluation, you will be given a referral form to be completed by your child’s health care provider. The completed referral form must be returned to the school nurse. Hearing screening will be conducted in the year of school entry and annually through grade 3, then in grade 7, and grade 10. Parents will be notified by school health personnel if follow-up of hearing screening is required. If your child is referred for further evaluation, you will be given a referral form to be completed by your child’s health care provider. The completed referral form must be returned to the school nurse. All 5th through 9th grade students will be screened yearly by the school nurse for scoliosis. Information and opt out notices will be sent home prior to screening. If a parent/guardian opts out of postural screening by the school, they must submit written documentation of a scoliosis exam by their primary care provider to the school nurse which includes the date and results. Parents will be notified by school health personnel if follow-up of postural screening is required. If your child is referred for further evaluation, you will be given a referral form to be completed by your child’s health care provider. The completed referral form must be returned to the school nurse. SBIRT is a confidential screening for the use of alcohol, marijuana and other substances. The goal is to let students know that we are available to reinforce healthy decisions and to assist them in obtaining support if needed for substance use. All 7th and 9th grade students will be screened using the CRAFFT-II tool. Information and opt out notices will be sent home prior to screening. Students can also opt out on the day of screening. Screenings are not required but may be offered at your child’s school through Forsyth or Polished Dental. Information with permission slips to participate will be sent home during the school year or you can contact the school nurse for more information. The Lynn Public Schools will be conducting an annual state mandated program that focuses on screening for the use of alcohol, marijuana and other substances. Our goal is to let students know that we are available to reinforce healthy decisions and to assist them in obtaining support if needed for substance use. This year, we will screen 7th and 9th grade students. All screenings will be conducted by either a guidance counselor, school nurse, social worker or health teacher confidentially in private one-to-one sessions. We will utilize the CRAFFT-II screening tool. Students who are not using substances will have their healthy choices reinforced by the screener. The screener will provide brief feedback to any student who reports using substances, or who is at risk for future substance use. If needed, we will refer students to our guidance staff or social worker for further evaluation. This program focuses on harm prevention and does not generate disciplinary action. Results of the screening will not be included in your student’s school record. Every student will be given educational materials on substance use that includes resource information. As with any school screening, you have the right to opt your child out of this screening. Please notify the school in writing. Additionally, screening is voluntary and students may choose not to answer any or all of the screening questions. We encourage all parents/guardians to talk with their child about substance use. More information and resources are available here and at your child’s school. Together, schools and parents/guardians CAN make a difference for our youth. Please try our webpage translator available on the bottom of every LPS website page. Please notify the school if you need any of the above information translated into any other language. Fever - For a temperature by mouth of 100.4° or higher, please keep your child home until they are fever free for 24 hours without fever reducing medications such as acetaminophen (Tylenol) or ibuprofen (Motrin or Advil). Vomiting - Keep your child home for 24 hours after last episode and until child can keep down food and fluids. Diarrhea - Keep home until symptom free for 24 hours. Rash - Rashes can have many different causes. If rash is unusual or accompanied by a fever, have your health care provider make a diagnosis and provide a note for return to school. Colds, Cough, Runny Nose - If your child does not have a fever, is coughing or sneezing infrequently, and is able to manage secretions, they may attend school. Please keep your child home, if they have a congested or uncontrollable cough or excessive secretions. Asthma - If your child has wheezing, coughing, shortness of breath or chest tightness that doesn’t improve after taking a quick relief medication, please keep your child home and contact their health care provider. Sore Throat - If sore throat is accompanied by fever, swollen glands, pain or swallowing difficulties, please have your child checked by your health care provider. Stomachache - Please keep your child home if they have pain lasting more than 2 hours and/or fever, vomiting or diarrhea. Headache, Earache, Toothache - Your child can attend school if pain can be managed by over the counter medications while awaiting an appointment with dentist or doctor. Child should be kept home for severe pain. Red Eyes or Discharge from Eyes - If the white part of the eye is red or itchy and there is a yellow, green or crusty discharge, your child should be evaluated by their health care provider.